Thursday was day four of the 8th Annual American Craft Week and due to prior commitments I had to miss a day of visiting an award winning craft brewery. We have a business networking group, BusinessNBeer.com that meets every Thursday at a different microbrewery, brewpub or gastropub in the South Bay area. 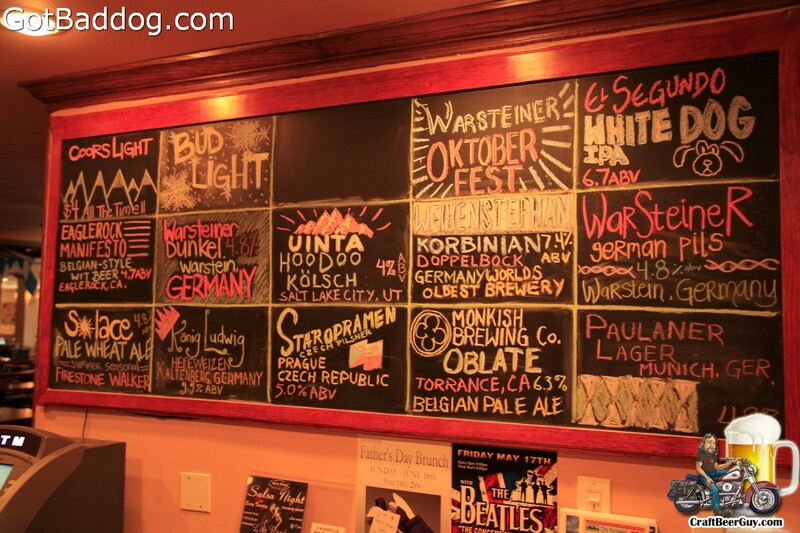 This week we met at Alpine Inn at Alpine Village in Torrance, a German gastropub that has a pretty nice craft beer selection. Alpine Inn is probably best known for their annual Oktoberfest that they have held every year since 1968 making it the largest and oldest Oktoberfest celebration in Southern California. A lesser known event is the Alpine Village Bier Fest which was held for the first time in September 2012. There were 100 beers from 50 different breweries, many of them very hard to find. It was a great event, but it had a very low turnout; luckily Alpine Inn has a couple nice cellars so the beer that was not consumed was stored for safe keeping. While Alpine Inn did have a couple award winning breweries represented on draft last night, Firestone Walker and Uinta Brewing, I do not particularly care for Firestone’s Solace and I was not really in a mood for a Kölsch (I might have made an exception if they were from California), so I opted for a White Dog IPA from El Segundo Brewing Company and a Manifesto from Eagle Rock Brewery. You can see all the photos from our Business & Beer gathering at Alpine Inn on GotBaddog.com. It was still early by the time our meeting ended and I wanted to find an award winning beer to drink, so we headed to Hot’s Kitchen in Hermosa Beach. 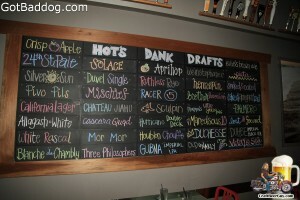 I have been to Hot’s Kitchen a couple times, so I knew they had a pretty nice beer tap list. 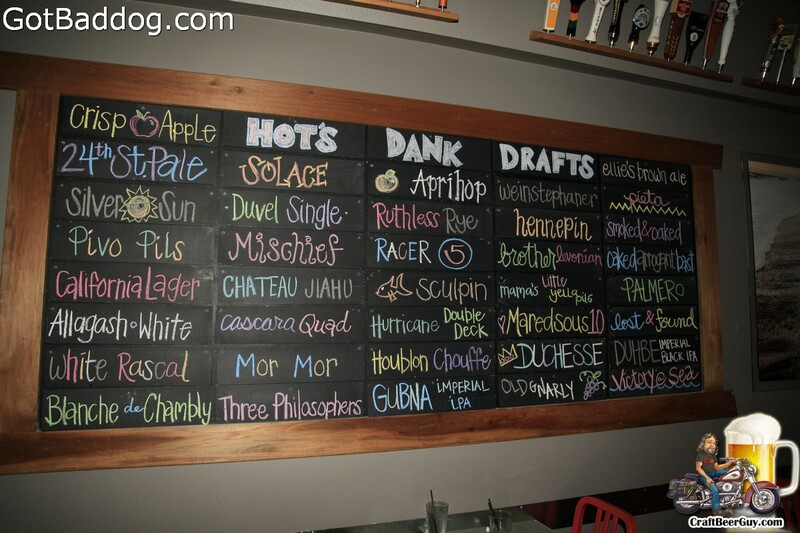 While their beer list is extensive and the beertender said she was a fan of craft beer, she did not know it was American Craft Beer Week and she really had no clue which brewers might be award winners much less if any of the beers were. The point is they have a very nice beer selection, but don’t expect much in the way of advice; however, they are good about giving tasters to try some if you are unsure what you want. Luckily, we had Internet with us, so after a little research I settled on an Epic Brewing Hopulent IPA (2012 Australian International Beer Festival Silver medal). While there I also tried a Hangar 24 Palmero and a Mor Mor from Brouwerij West. You can find all my photos from day four of the 2013 American Craft Beer Week on GotBaddog.com.